Sean Rafferty presents performances by some of the world's finest musicians. Live music from pianist Yu Kosuge and violinist Franziska Pietsch. Plus, composer Gabriel Jackson. Sean Rafferty presents a lively mix of music, conversation and arts news. Pianist Yu Kosuge plays live for us before she gives the UK premiere of Dai Fujikura’s 3rd Piano Concerto with the BBC Scottish Symphony Orchestra in Glasgow on Thursday. 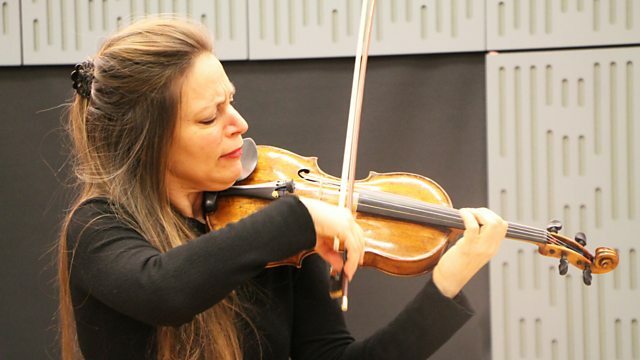 Violinist Franziska Pietsch also performs live for us - music by Richard Strauss from her new CD - and composer Gabriel Jackson looks forward to the release of his latest CD, which features the Choir of Merton College, Oxford singing his Passion of Our Lord Jesus Christ. Handel and the Oratorio for Concerts. Performer: Niek de Groot. Performer: Minna Pensola. Performer: Antti Tikkanen. Performer: Tuomas Lehto. Singer: Emma Tring. Choir: Choir of Merton College, Oxford. Ensemble: Oxford Contemporary Sinfonia. Conductor: Benjamin Nicholas. Singer: Guy Cutting. Choir: Choir of Merton College, Oxford. Ensemble: Oxford Contemporary Sinfonia. Conductor: Benjamin Nicholas. Performer: Antoine Tamestit. Orchestra: London Symphony Orchestra. Conductor: Valery Gergiev. Performer: Franziska Pietsch. Performer: Gamal Khamis.